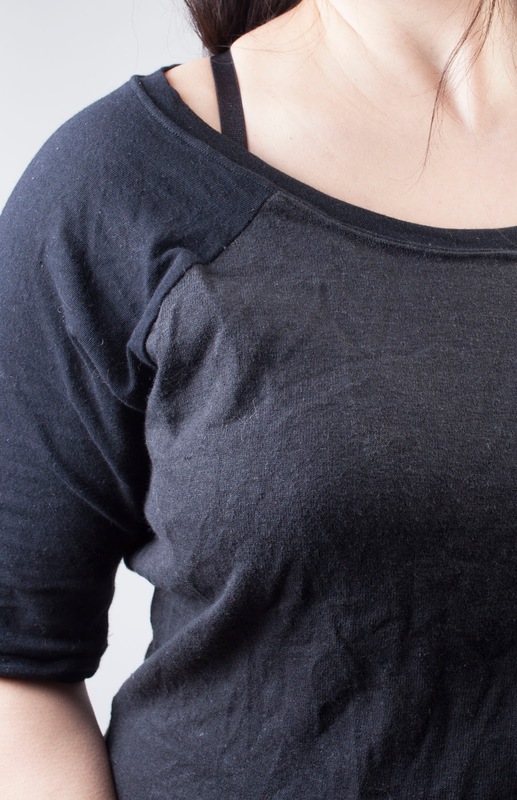 Tees are such fun to sew... especially when you have a great pattern! 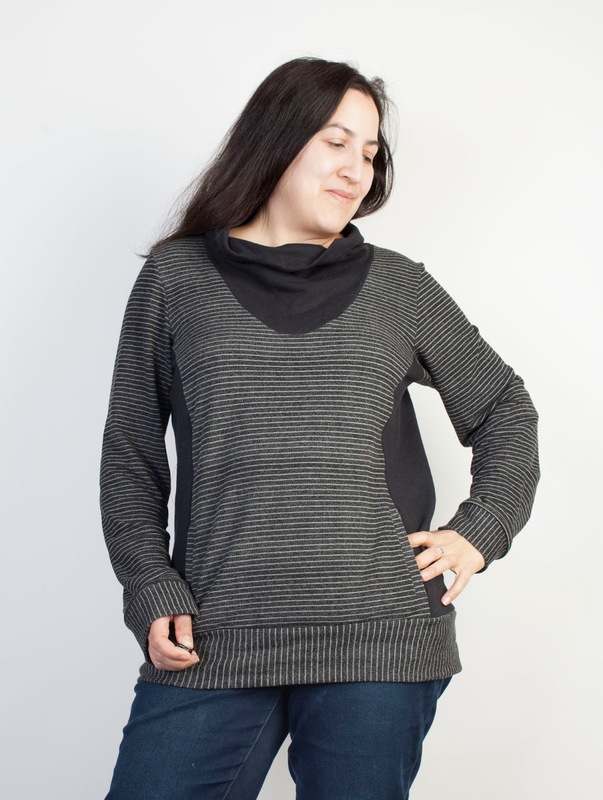 This is the Lane Raglan by Hey June patterns, which she recently updated. I actually hadn't gotten around to making any basic Ts before the update came out, so I can't give a side-by-side comparison. 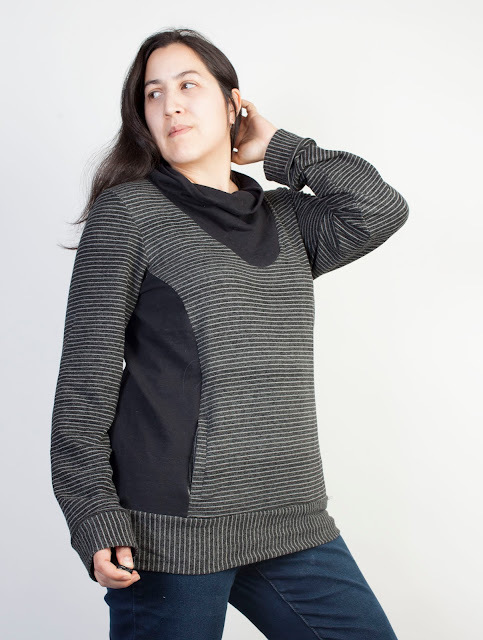 I did use the old Lane Raglan to make a sweatshirt, which I love, but that isn't really a good test since the fit of a sweatshirt is pretty fluid. The new version comes with a Full Bust Adjusted (FBA) pattern piece, and since I'm a C cup, I used this. I cut a medium top and graded to a large at the hips. 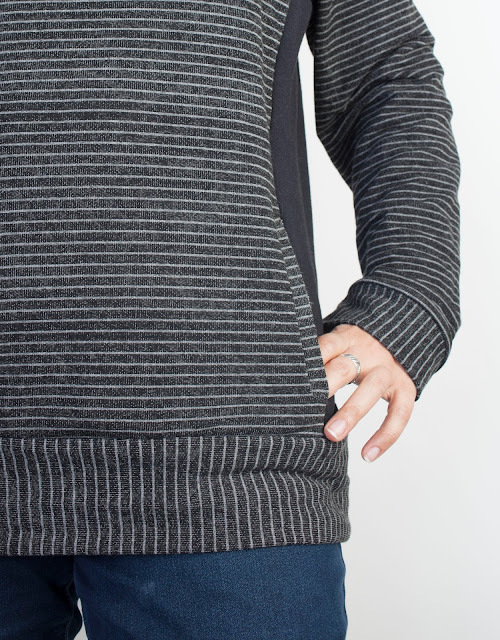 The fabric I used wasn't very stretchy-- the black version uses two remnants, the grayer black is a hemp jersey and the sleeves are cotton jersey, no spandex. The fit is pretty good with no adjustments. It is a little loose, but I'm fine with this in a casual T, but if I was using a stretchier spandex jersey I might size down one size. I sewed it up with no pattern adjustments, but really didn't like the shaped front hem. The shaped back hem is great, but I thought the shaped front increased the illusion of belly roundness. I don't need any help in that department. I guess the shaped hem would be nice if you wear your Ts tucked, but I almost never do. So I pulled the hem, cut it straight across, and re-hemmed it with my twin needle. The one other thing that I didn't like on my first version was how wide the neckline is. Most of my bras are racerback, and I don't like how wide necklines show my bra straps. So on my second version, I added 2 inches to the neckline on the shoulders, and one inch in the front and back. I adjusted the neck band to fit by using the measured length of the new neckline and subtracting 3 inches. 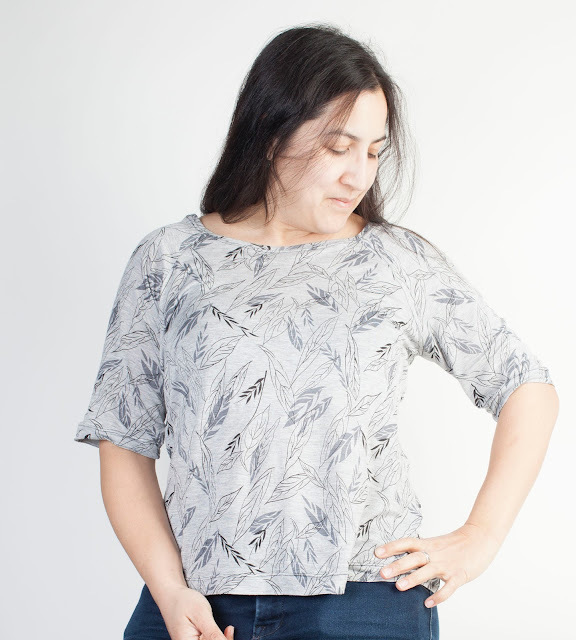 This gray leaf print jersey T shows those changes to the neckline, and I'm much happier with the fit. 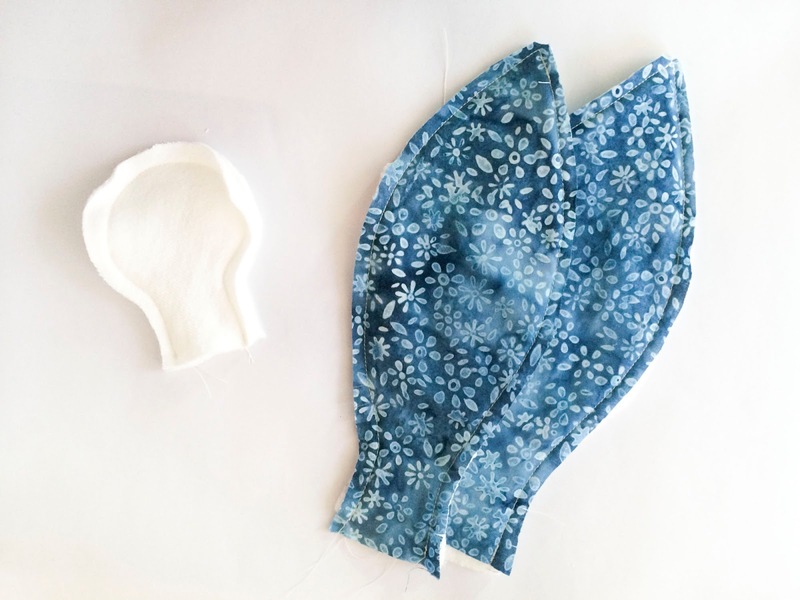 This version is sewn in a very lightweight, non-spandex jersey. I definitely think I will get a lot of mileage out of this pattern. 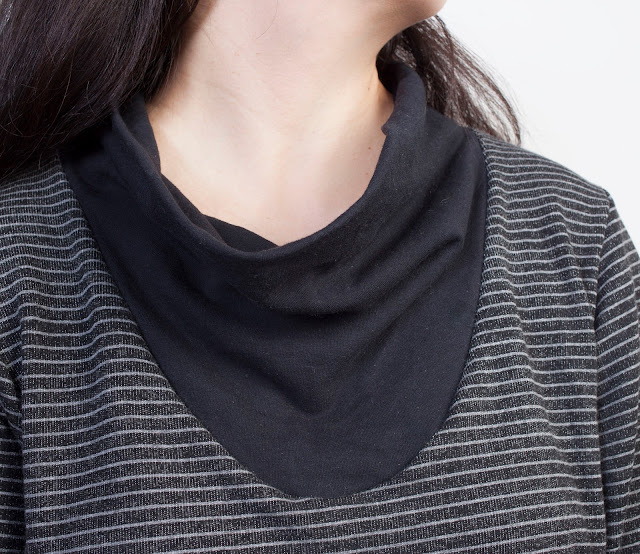 I'm loving the raglan sleeve right now, and there are lots of fun options to play with, including a hood and cuffs with thumbholes. I think this T would also look really snazzy in a rayon-spandex jersey, sized down one size. I think I have my new favorite T pattern... what's yours? 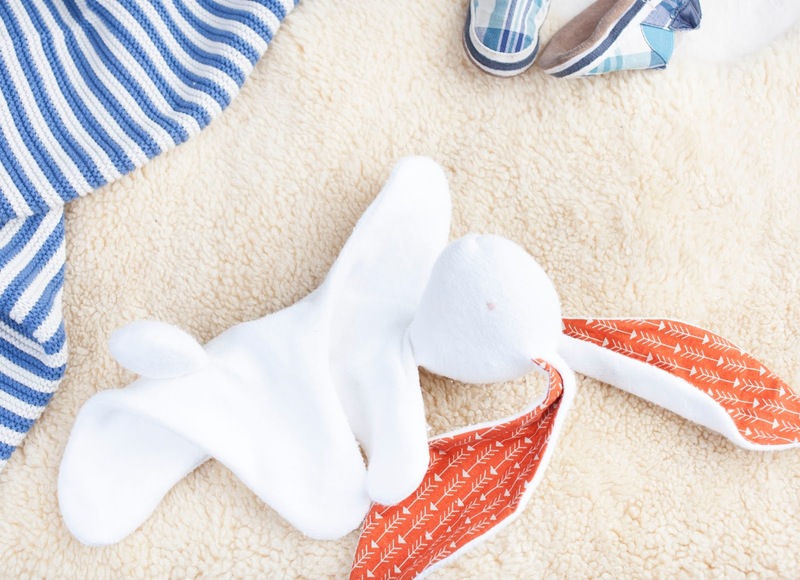 The Bunny Lovey is a sweet little blanket doll. 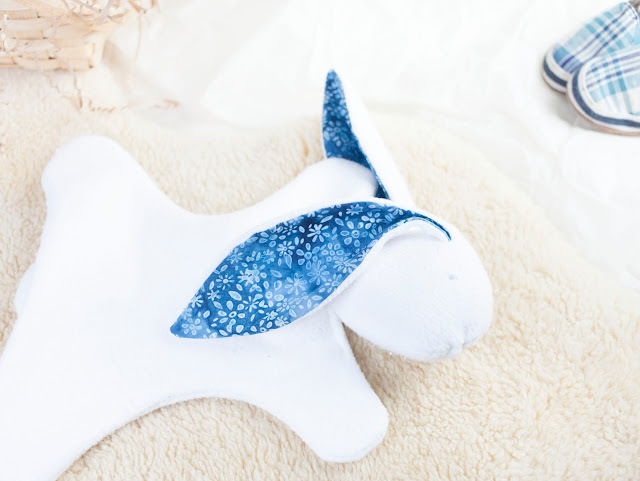 It would be a lovely gift for a newborn! 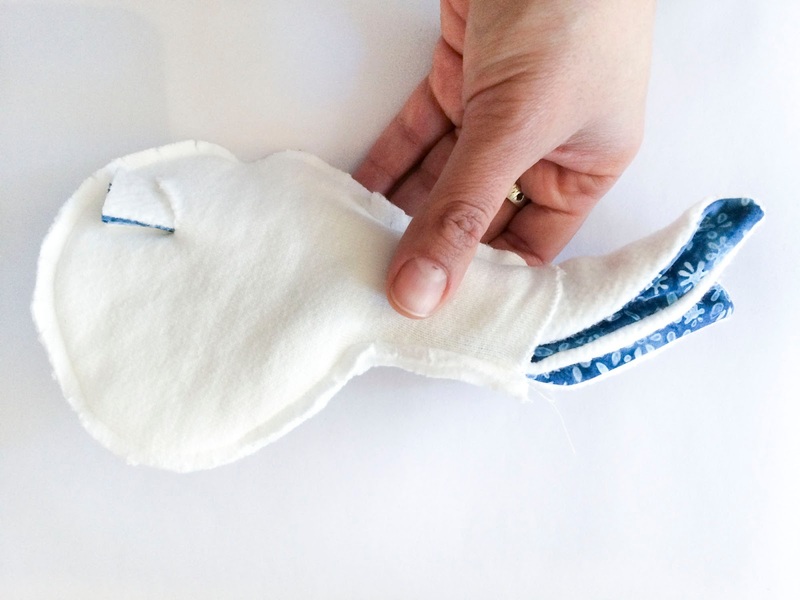 And it is quick to make if you have a sewing machine and some basic sewing skills. The pattern is FREE... just sign up for our mailing list on the sidebar. After you confirm your subscription, you will be sent a "Welcome" email that has a link to the pattern. 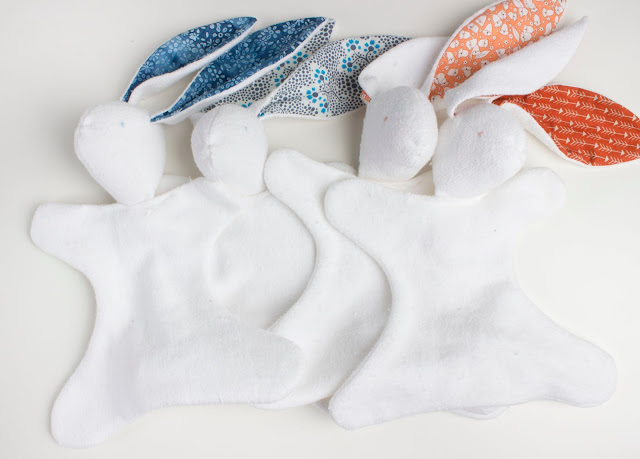 With the free pattern, you can make as many bunnies as you like to give as gifts or for charity. 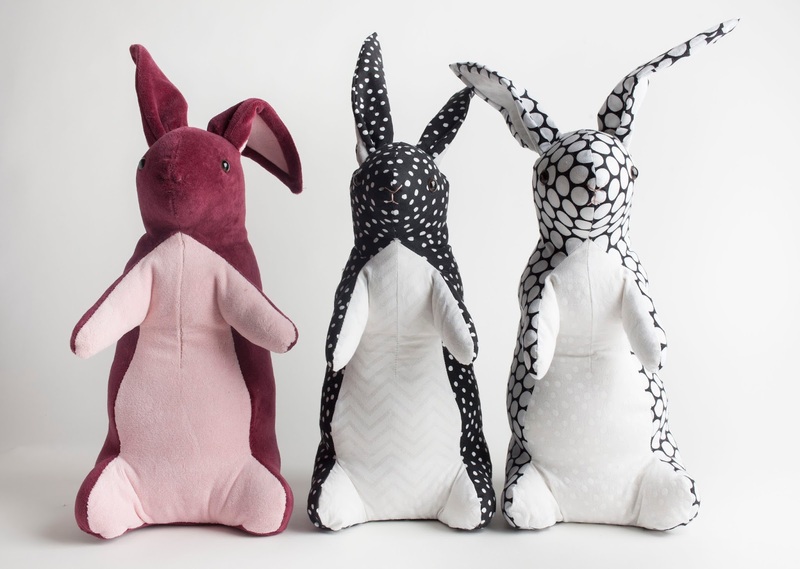 If you would like to make bunnies to sell, please purchase the paid version of the pattern from my Etsy Store... it is just $5, and includes the right to sell your handmade creations. UPDATE August 2016... the PAID version on Etsy now includes downloadable, illustrated instructions. But once again, you can totally make this for free by subscribing to the newsletter and using the instructions here on the website. If you sign up for the newsletter and you don't see the "Welcome" email, be sure to check your spam folder or the "Promotions" tab if you use Gmail. --1/4 yard or a fat quarter of your main fabric. 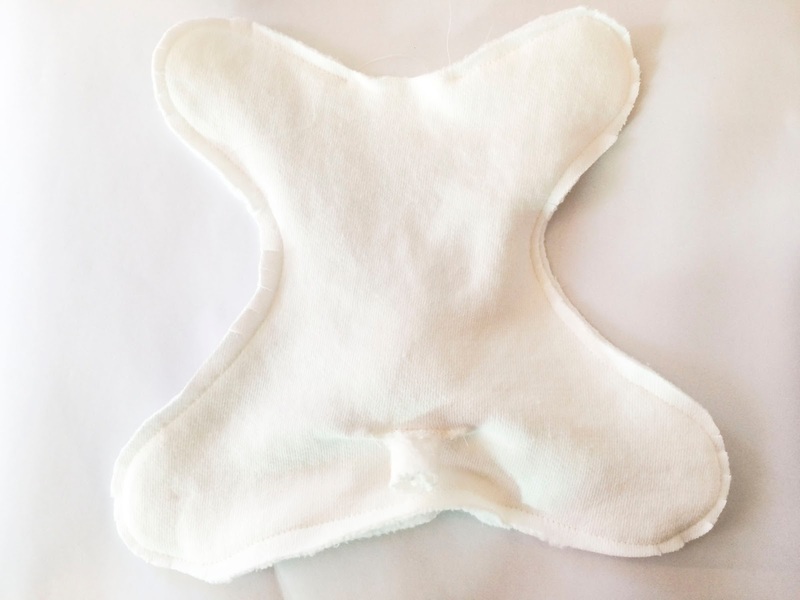 I used an organic cotton fleece, but this could could be any fabric that is soft and snuggly. It would be lovely in a french terry or a velour! --A very small amount of contrast fabric. I used colorful quilting cottons. 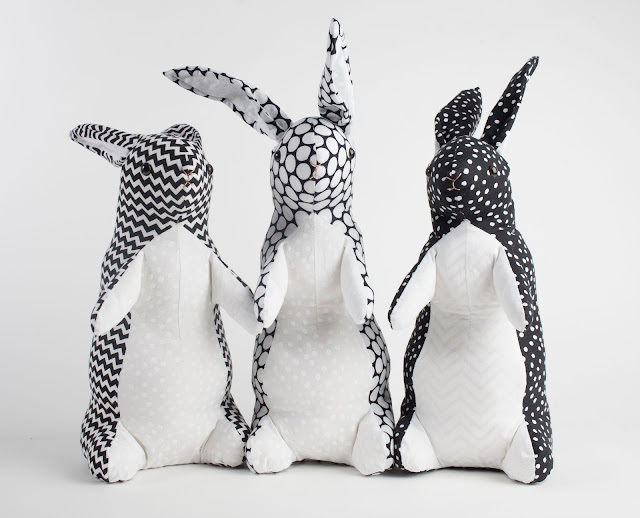 --The Bunny Lovey pattern. 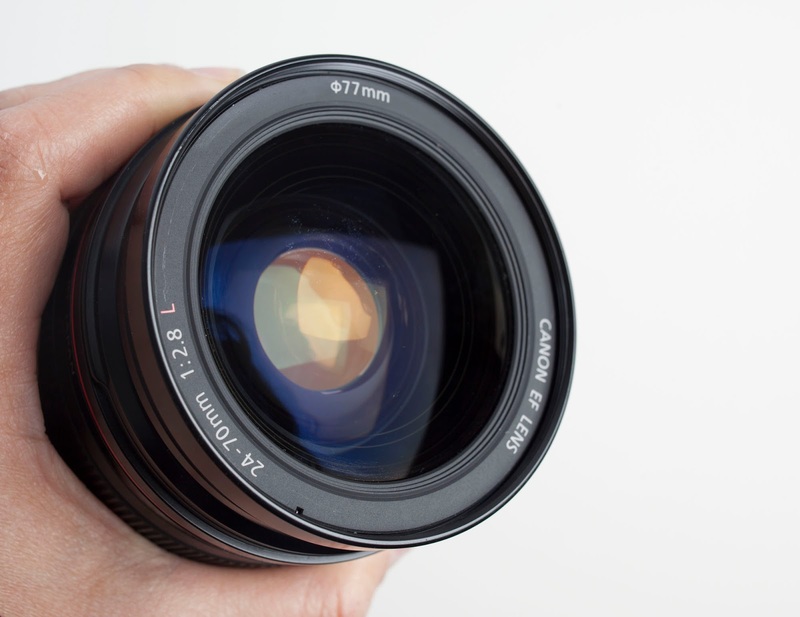 It is free-- just sign up for our newsletter on the sidebar. After you confirm your subscription to the email list, you will be sent another email with a link to the pattern. 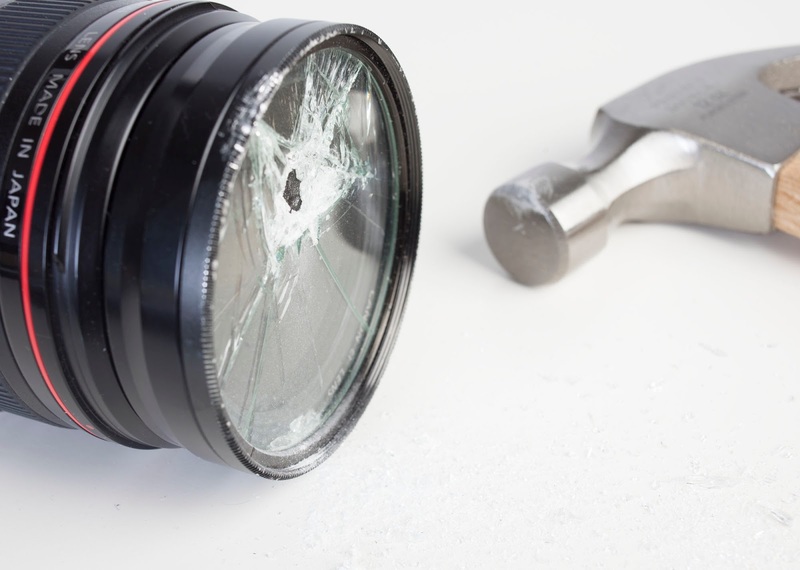 It is just two pages, and no taping necessary. --Embroidery floss for the eye. --Stuffing for the head and tail. I use wool batting or roving, but you could also use cotton batting or poly fill. 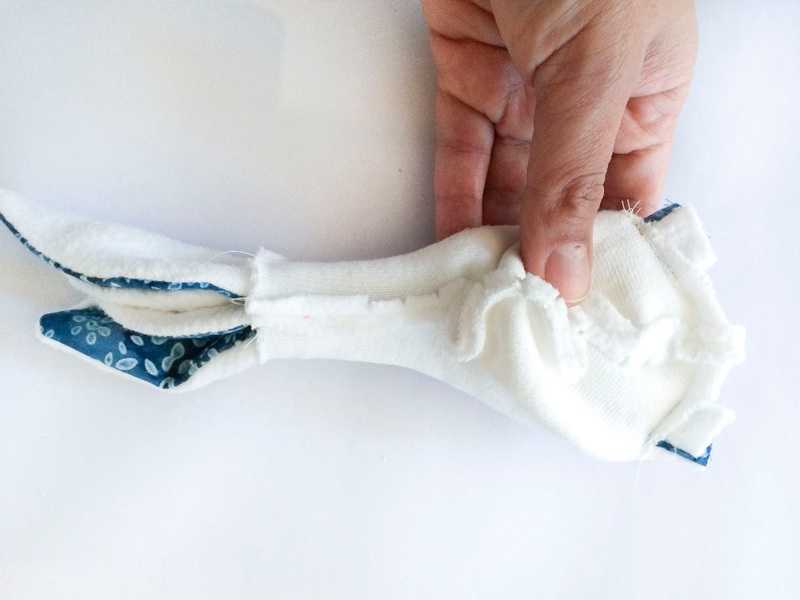 Sew all seams with a 1/4 inch seam allowance. Print out the PDF pattern on letter sized paper. 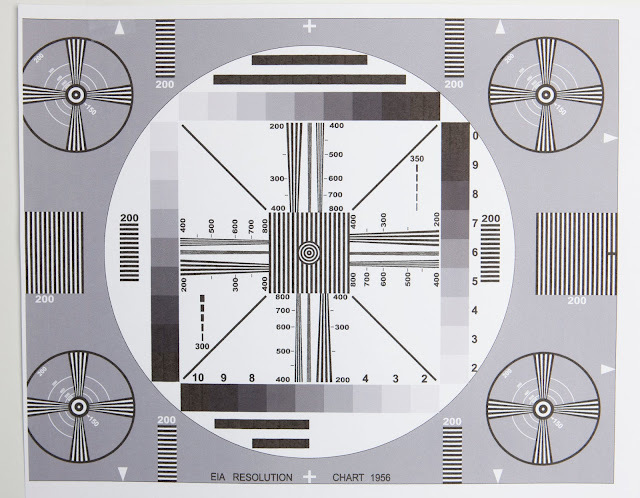 Make sure the printer resize the page, I always set scaling to 100% on my printer. Cut out the paper pattern pieces,and lay them out on your fabric. Make sure the arrows on the pattern pieces align with the grain of your fabric. 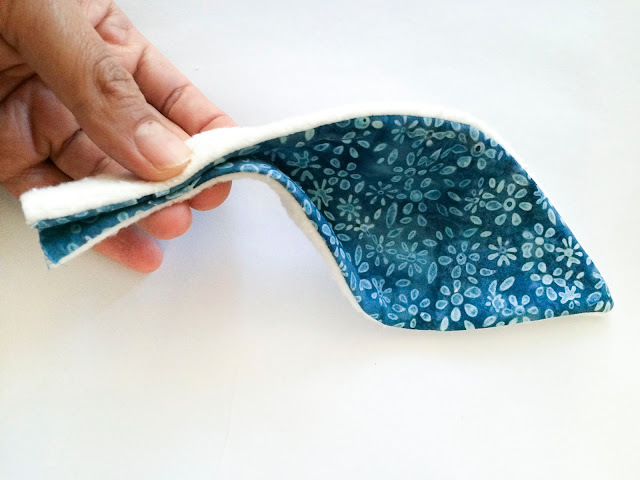 If you are using napped fabric like velour, the arrow should point in the direction that the fibers naturally lay down. 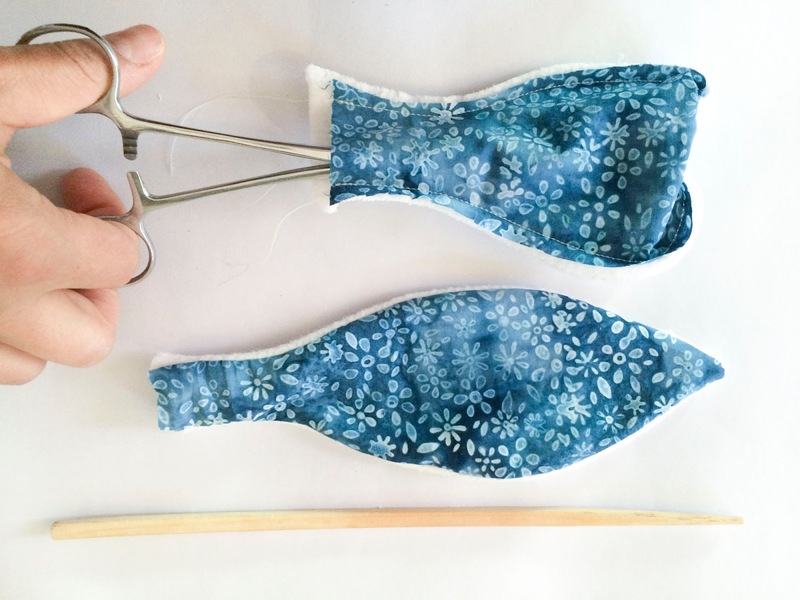 Cut your pieces from your fabrics, as indicated by the directions on the pattern pieces. Transfer markings for the placement of the ears, eye, and tail. Sew together the two tail pieces, right sides together. Leave an opening at the base of the tail for turning and stuffing. Sew together the ears with each ear having one piece of main fabric and one piece of contrast fabric, right sides together. 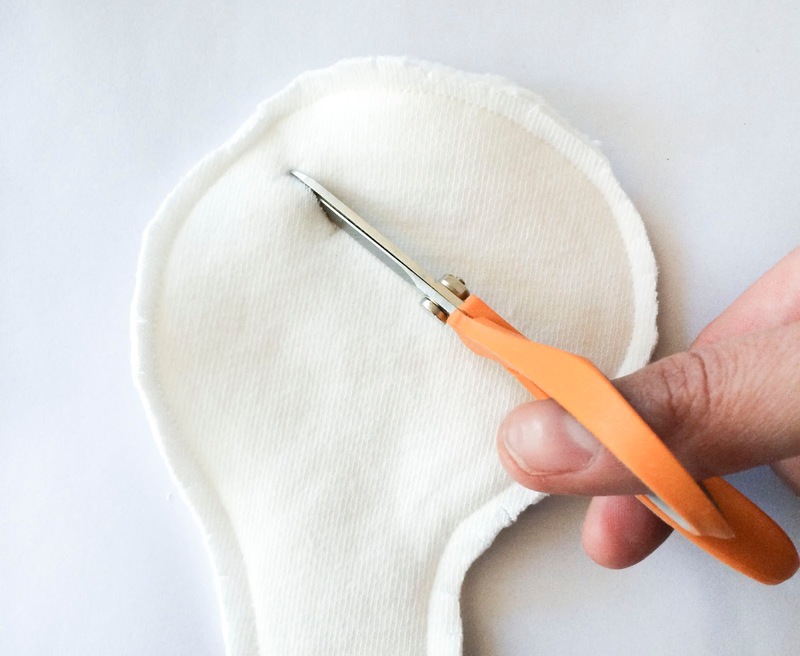 Clip the point of the ear straight across, close to but not touching the stitching. Turn the ears and the tail right sides out. If you have hemostats, use them to grab the tip from the inside and pull it through. Otherwise, use your fingers and a stick (like a chopstick). Press them flat. Put the head pieces right sides together. Sew around the head leaving the neck open. Clip the curves, being careful not to cut your stitching. 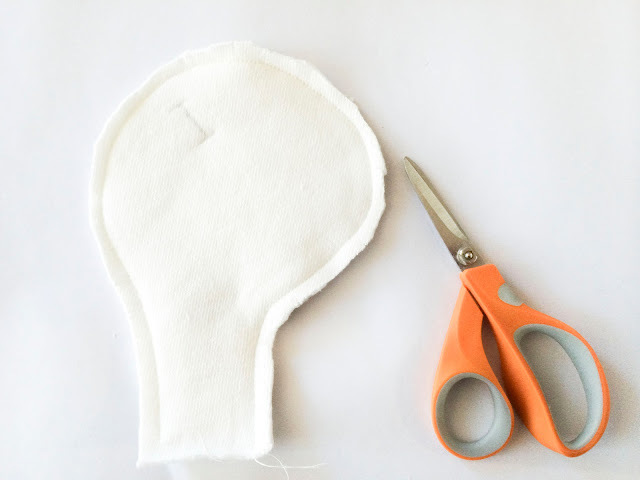 Cut a slit in the head for the ears, where indicated by the pattern. Cut through both layers of the head. 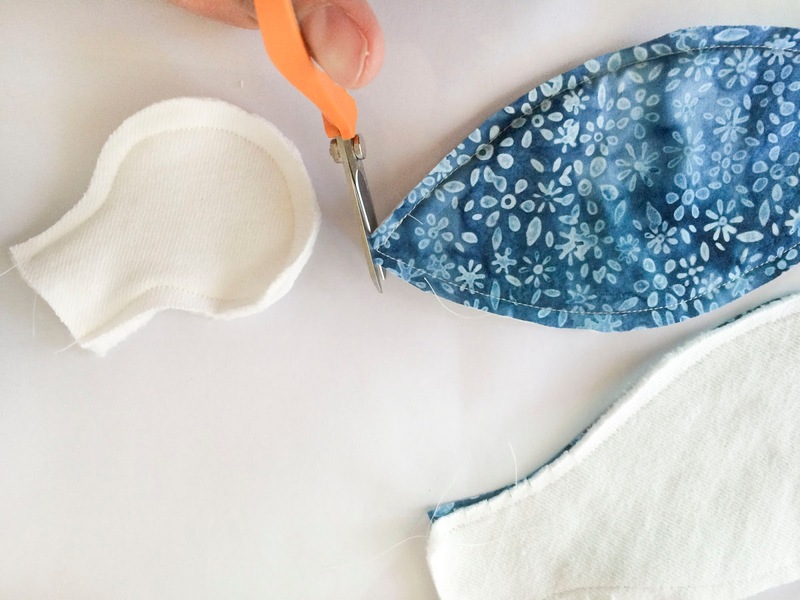 Fold the ears in half, with the contrast fabric on the inside. Stick the ears up through the neck into the head and through the holes you made. The fold should be to the back of the head. Arrange the head so that the seam allowance is in the center, and the ears sit flat. The folds of the ears should point towards each other. Sew across the top of the head from ear to ear, catching the raw edges of the slits you made. Pull the ears to turn the head right side out. 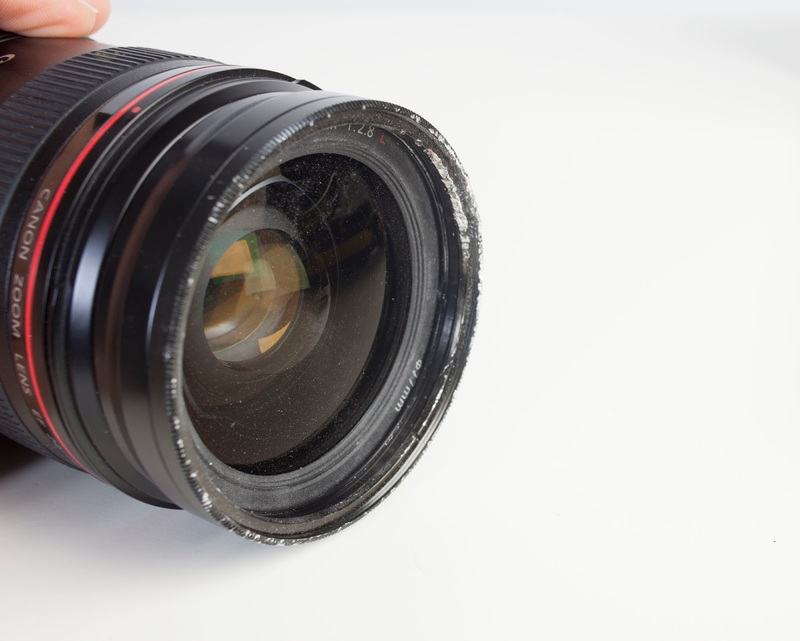 Smooth the seams flat with your fingers. Stuff softly with wool (or your choice of stuffing). 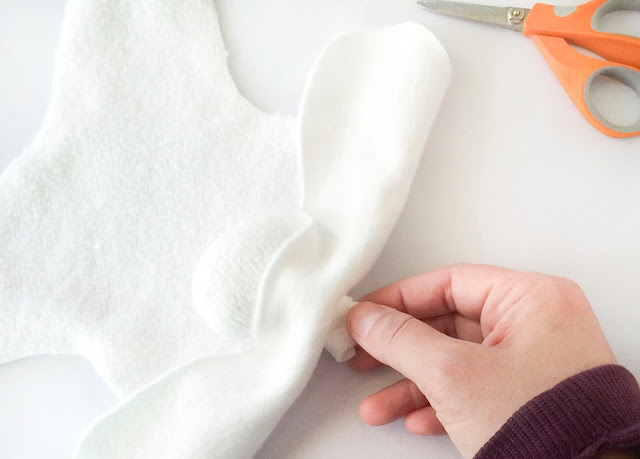 Sew the bunny nose and mouth. 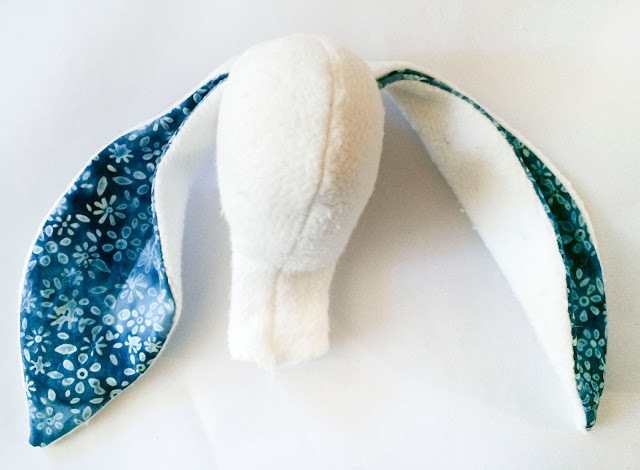 I used a double strand of white sewing thread to give just the shape of bunny cheeks and nose. You could also use pink embroidery thread to give a stronger impression of the face. Hide your knots inside the head. 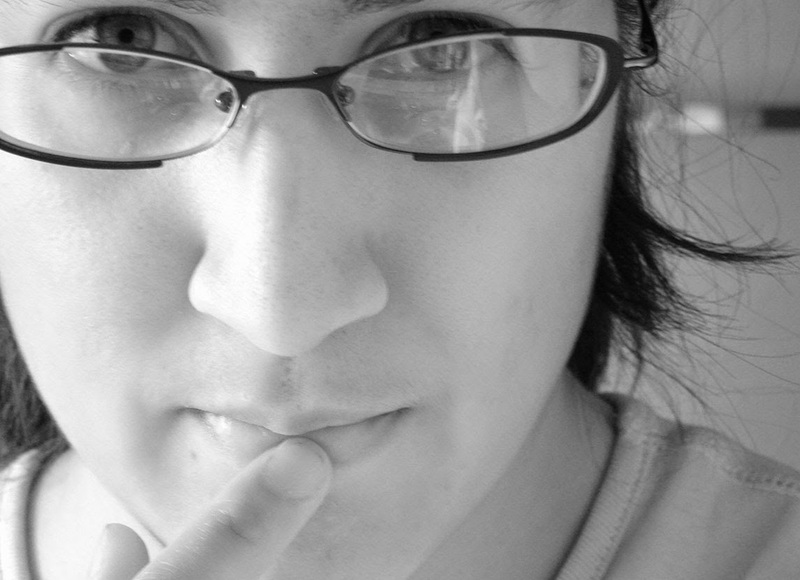 Decide where you want the eyes. Use the markings on the pattern as a guide, but make sure it looks right for your bunny, with the personality you want to give it. I use a pin with a colored head to make sure I like the placement. 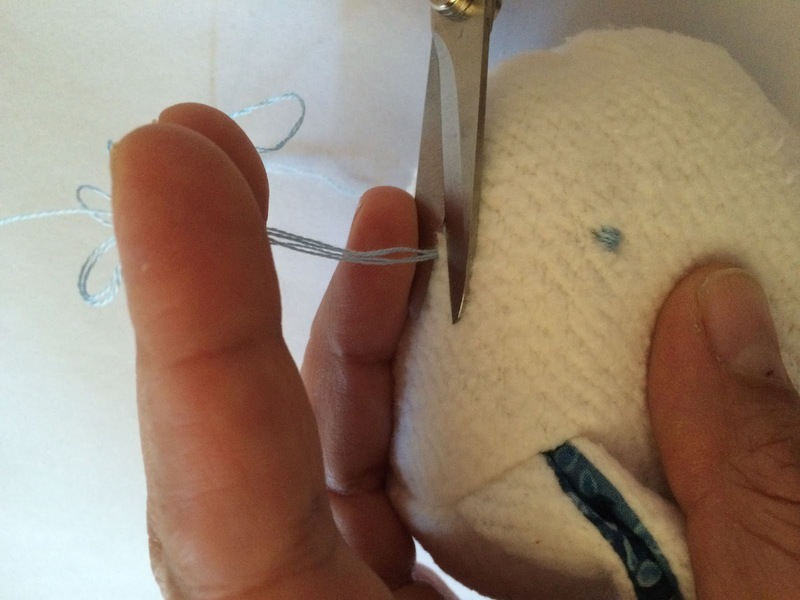 Sew the eyes with embroidery thread. I used blue on this bunny, but I also use brown or pink (albino bunny!). 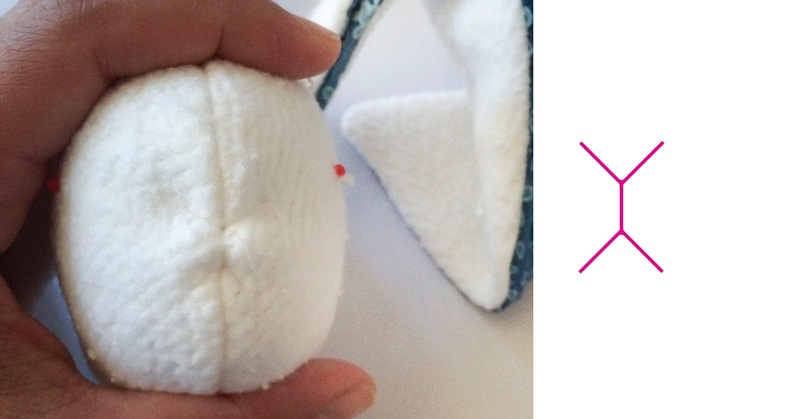 You could also just leave the eyes off to make a super minimal bunny. Hide the knots inside the head. Here I have knotted my strands, then threaded both ends through the needle and pulled them back through the head. I'll clip the strands close to the head and the ends will disappear into the stuffing. Attach the tail to the body. 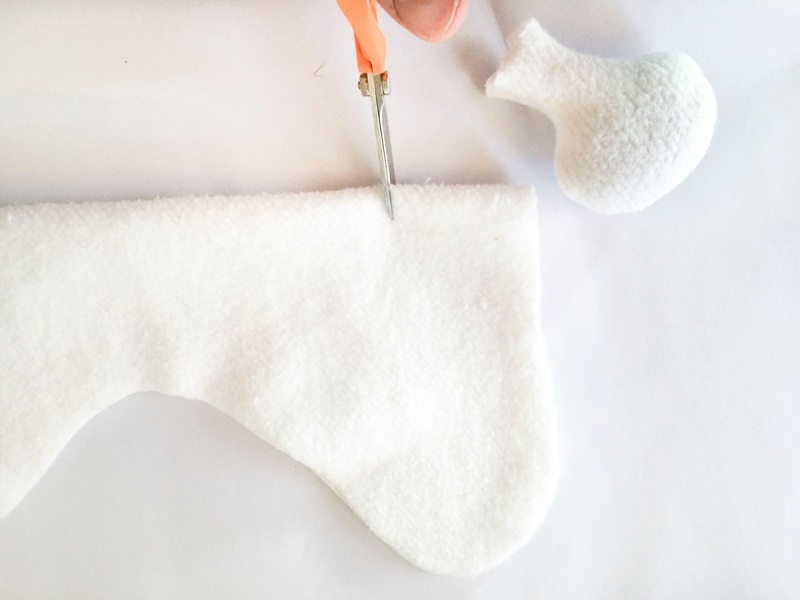 Cut a slit where indicated on the pattern, about two inches from the bottom of the bunny. Stuff the tail. Slip the tail through the slit, with the tail of the tail on the inside. Sew across the base of the tail from the inside, catching the raw edges of the slit. Taper to nothing on either side of the tail. Sew the body together. Leave about two inches open at the center of the neck for turning and inserting the head. Clip curves. Insert the head into the body. 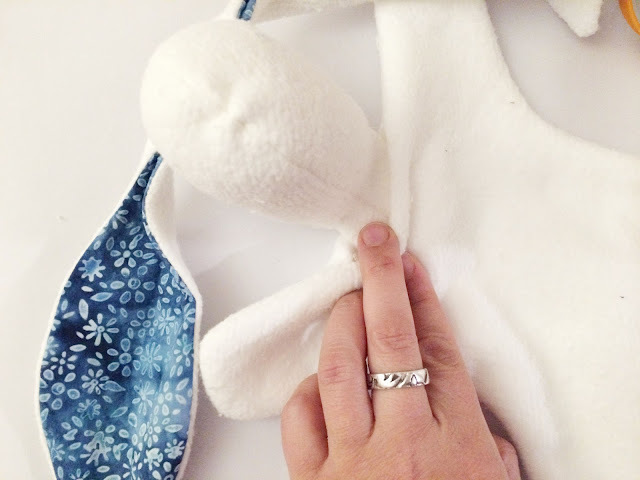 Push the stuffing up into the head so that the neck is as flat as possible. Make sure that the raw edges of the body pieces are turned to the inside. Starting about 1/2 inches before the opening in the neck, sew cross the base of the neck, catching the turned under edges of the body and the neck. Sew past the opening by 1/2 inch. I use a zipper foot on my machine to get as close to the head as possible. And you are done! You now have a beautiful toy that you can feel totally good about giving to some little person you love. Sometimes one just needs to do some selfish, satisfying sewing. 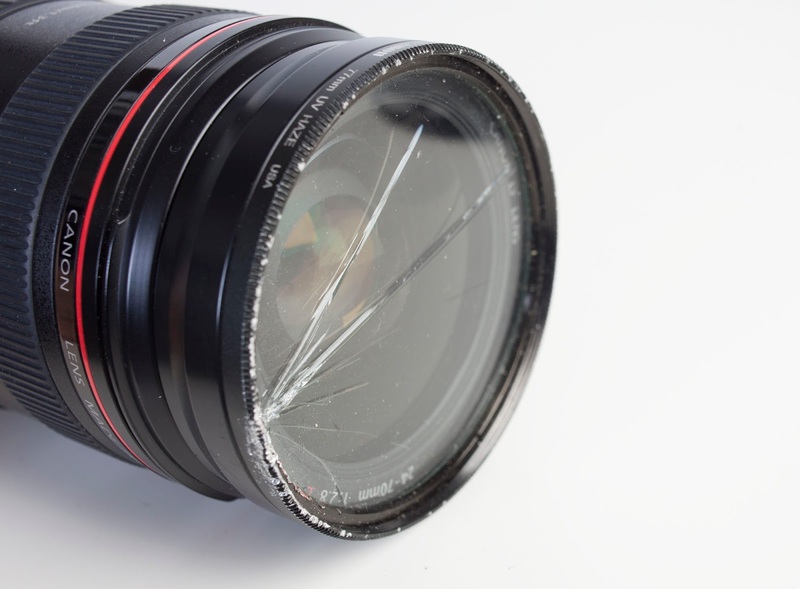 You know the feeling, I'm sure. 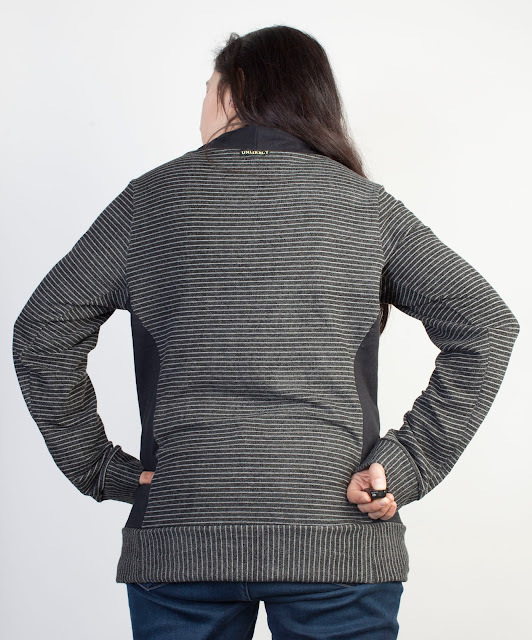 This is the Jasper Sweater from Paprika Patterns. I've been wanting to make this for well over a year. The design appealed to me immediately... casual, but not sloppy, with nice details. I found the perfect fabrics for it at Marcy Tilton's online fabric shop. The striped fabric is a bamboo/cotton french terry, and the solid black is an organic cotton french terry. I don't see either of these in her shop right now, but she does have some lovely bamboo blend fleeces. The pattern calls for a fabric with some weight and structure, especially for the collar area. I used the cotton french terry for this area because the bamboo terry was a bit drapey. The welt pocket was surprisingly un-fussy. I didn't even break out the interfacing, although I was tempted. 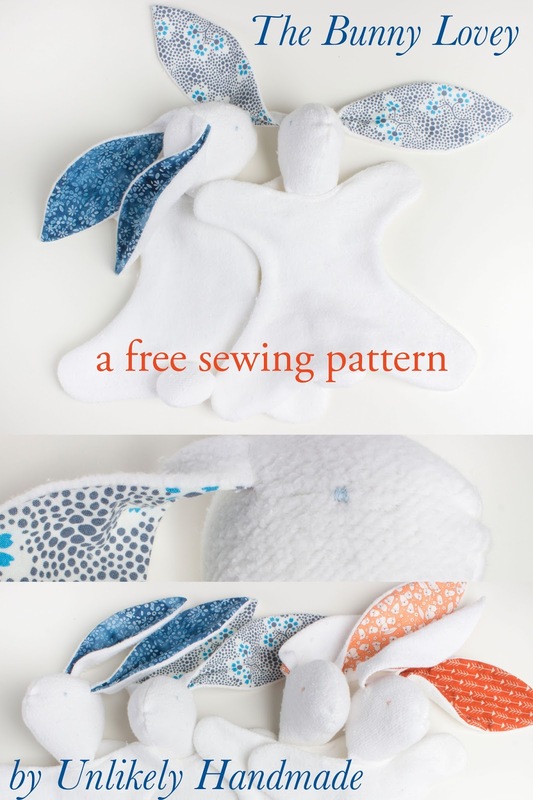 There is a tutorial on the Paprika Patterns website that guides you through the process. I've never done a welt like that... good to know for all those times when you want to make a single welt kangaroo pocket ;). 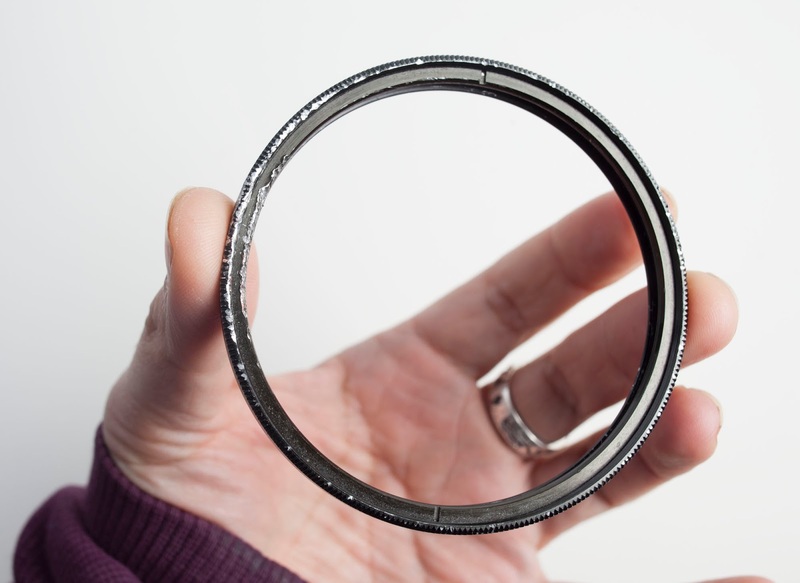 I cut the cuffs and bottom band on the cross grain to play with the stripe direction. The bamboo french terry had plenty of stretch, so I wasn't too worried about it. The fitting of a sweatshirt isn't too complicated, but I'm pretty fussy... and this one fits my body perfectly, with no alterations whatsoever. She provides two separate patterns for sizes 1-6 and 6-10, and with a 39 bust and a 40inch hip, I'm the size 6 that could go either way. Apparently the difference is that the 6-10 is drafted for a C cup, so I went with that. My fabrics are a bit on the light weight side for this pattern, and the 6 fits me pretty closely. 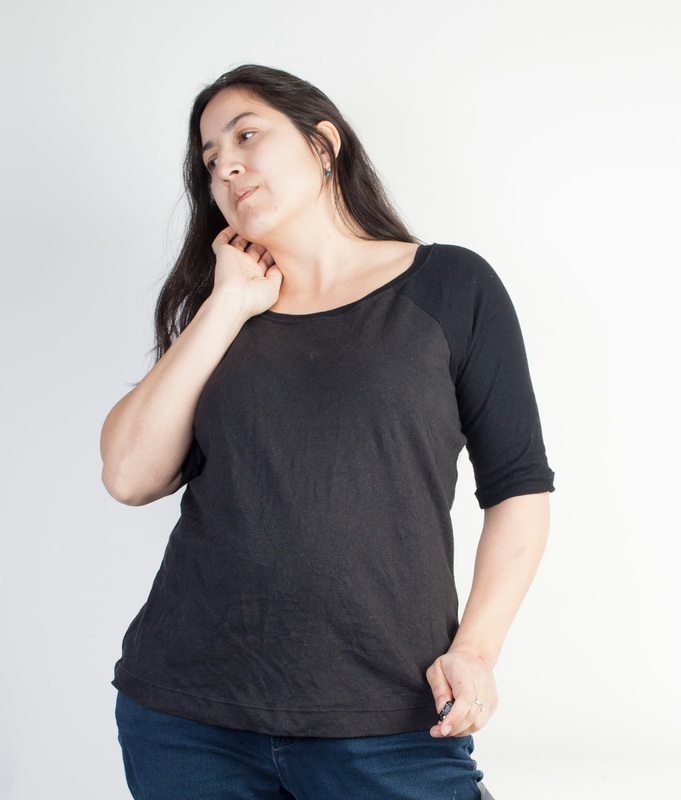 I could wear it over another shirt since it has plenty of stretch, but it works rather well as a standalone piece, and the terry is luxurious against the skin. From taping together the PDF to digging to power serging the cuffs took about 5 hours. Probably not such a good idea, since it means I didn't get much sleep. I did get my sewing fix though! I'm already thinking about fabrics to make another version! 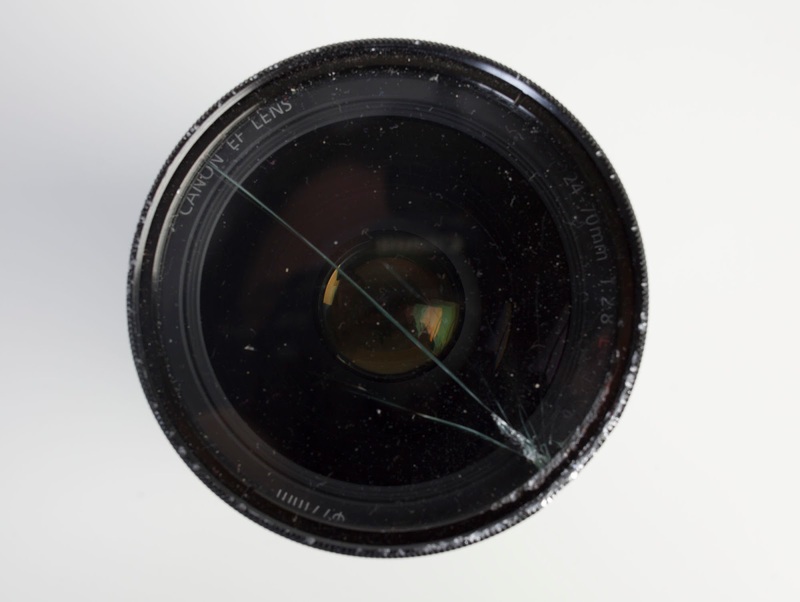 Spring is in the air... time for a sale. 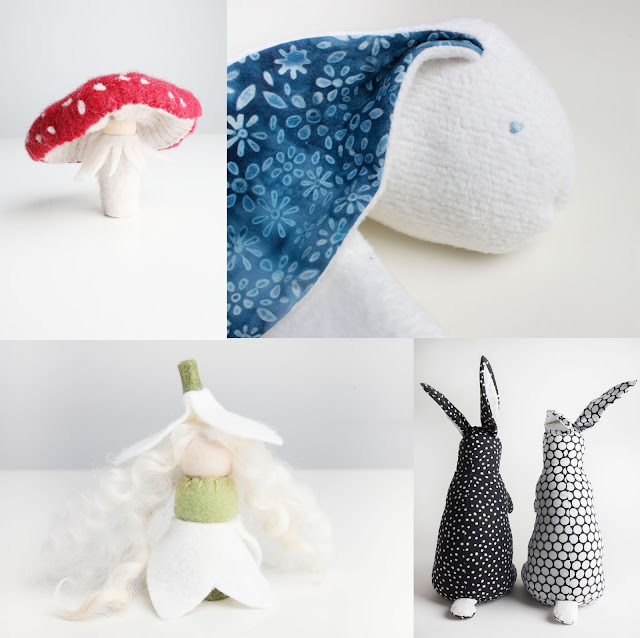 Amanita Muscaria Mushroom Person, Organic Cotton Bunny Lovey, Snow Drop Flower Fairy, Velveteen Rabbits in Polka dot cotton stuffed with wool. 10% on everything in the Unlikely Handmade Etsy Store with code LOVESPRING. I've always loved the story of the Velveteen Rabbit, and it re-entered my imagination when my daughter was given a copy of the book as a gift. With the coming of spring, I was thinking about bunny patterns that I could make for my kids. None that I saw really lived up to my idea of a stuffed rabbit, sweet and simple yet so close to REAL. So I decided to make my own pattern. The pattern is nearly ready... it needs a few finishing touches before I share it with you. 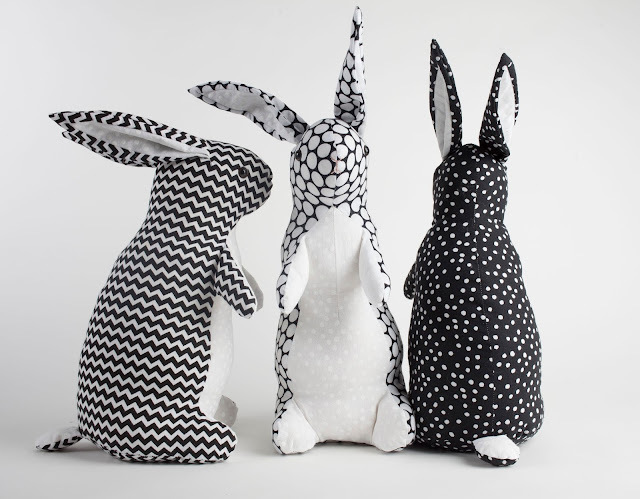 But I have some finished rabbits in my Etsy store, so I thought I would share them here. 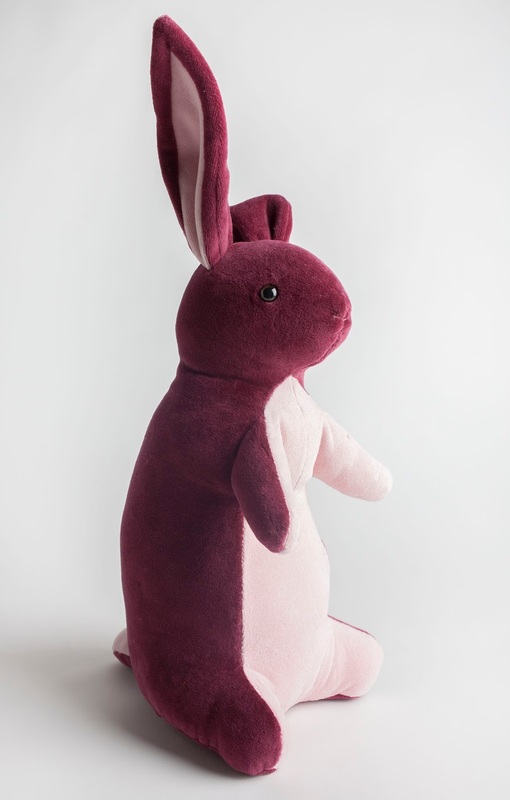 The burgandy and pink rabbit is made of cotton velour. The black and white rabbits are made from cotton woven fabric. They are all stuffed with wool. 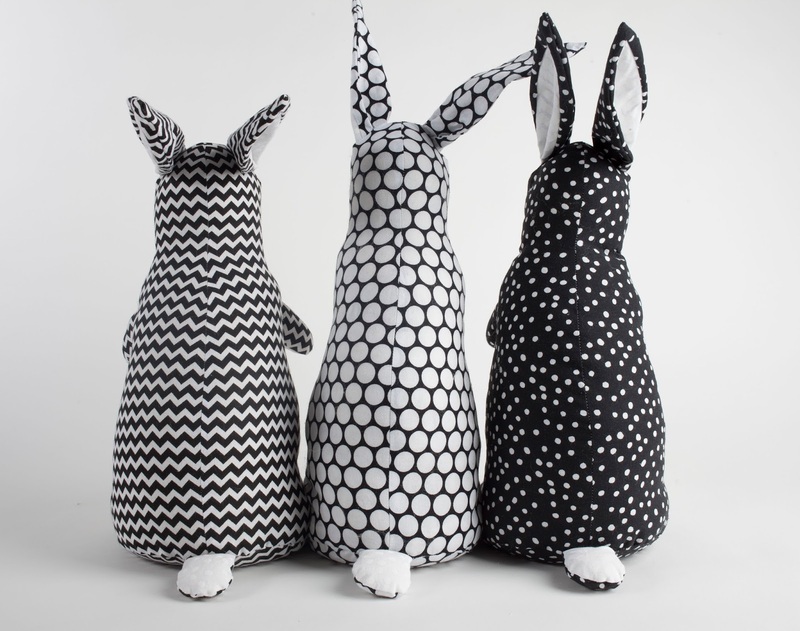 They are about 14 inches high with their ears down, and weighted to feel like a real rabbit (about 1.5 lbs each). My daughter snatched up the first one I made, and has been carrying it around with her since. I hope these find good homes!